This unique experience will bring the Bible to life as you study the Scriptures in their ancient context. Travel through Greece and Western Turkey walking in the footsteps of Paul and visiting the Churches of the Revelation. Explore ancient cities, discover Roman culture and stand where Paul stood. Lectures and Bible studies at each site w ill help you read the Bible with new depth and understanding. The tour is led by Tim Foster from Ridley College and Mark Wilson from the Asia Minor Resource Center. Comprehensive sightseeing tours and onsite lectures as outlined in the itinerary including all entrance fees. hotel accommodation in twin share rooms. Single rooms are available for an additional charge. All breakfasts & 11 dinners. Make your own arrangements or join the group on an Emirates flight which will take us on our journey to the lands of ancient treasures and Christian history via Dubai to Athens. Arrive in Athens mid-afternoon and transfer to the hotel located in the heart of the city. Beat jet-lag with a stroll to Syntagma Square or the Plaka district. Visit the Acropolis which features the iconic Parthenon before viewing Athens from Mars Hill where Paul engaged the philosophers of the day (Acts 17:19-33). Then, on to the Agora (Acts 17:17) which includes an impressive reconstruction of an ancient stoa. After lunch you can enjoy a free afternoon before dinner together. Leaving Athens, drive along the coast towards Corinth. Stop at the Corinth Canal, a wonder of 19th century engineering, before driving to nearby Cenchrea (Rom 16:1) to view the harbour where Paul sailed (Acts 18:18). View the diolkos, along which ancient ships were dragged to avoid sailing the long way around the Peloponnese, and then travel to Acrocorinth with its magnificent views towards Delphi. After lunch explore the ancient city of Corinth with its abundance of significant artefacts that shed light on the Epistles. See the Erastas inscription which relates to several of Paul’s letters (Rom 16:23, Acts 19:22, and 2 Tim 4:20) then the excellent archaeological museum, ancient agora, temples, theatre and bema where Paul was on trial before Gallio (Acts 18:12-17). We then head towards central Greece and overnight near Delphi. Delphi is second most important site in Greece (after the Acropolis in Athens). It was here that the Oracle of Delphi was situated since this was considered to be the place where heaven and earth met so the gods were close by. Continue through the mountains to Meteora where we see the world famous Byzantine monasteries that are perched precariously on summits of grey rock pinnacles of varied and beautiful shapes. Accommodation near Meteora. Travelling northward into Macedonia visit the recently discovered tomb of King Phillip (father of Alexander the Great). Passing Mount Olympus head to Thessalonica to view the old city ramparts, newly excavated forum, St George Church, and the Galerius Arch which rises over the famous via Egnatia. Time-permitting, visit the impressive remains of Amphipolis where the Spartans and Athenians fought. Overnight in Kavala (ancient Neapolis) for two nights where Paul landed with his disciples, Timothy and Silas (Acts 16:12). Drive to nearby Philippi where Paul baptised the first Christians on European soil (Acts 16:13-15) and was subsequently imprisoned. View the baptismal site of Lydia and visit the famous acropolis, agora, basilica and theatre. Take a closer look at beautiful Kavala where there will also be free time before dinner. Head across Thrace, a stretch of land that has been contested for centuries and enter Turkey. Visit Gallipoli to recall the experiences of the ANZACS with stops at ANZAC Cove, Lone Pine and The Nek. A scenic crossing of the Dardanelles leads to the hotel by the water. First stop is nearby Ancient Troy, well known from Homer’s Iliad, Brad Pitt’s Troy and for its extensive excavations. Walk the beach at Troas, where Paul had a vision during his second missionary journey and was called to Macedonia (Acts 16:8-13) and trace his journey to Assos (Acts 20:1-2). Spend a relaxing evening in a resort on the edge of the Aegean. Begin visiting the sites of the Seven Churches of Revelation with the impressive site of Pergamum (Rev 2:12-17). Specialist lectures on each site will be provided by Dr Mark Wilson, recognised as a leading authority on the biblical sites of Turkey. Take the cable car to the acropolis and get a feel for life in the midst of Roman paganism viewing the many temples and visit the ruins of the library. Continue south to Izmir (ancient Smyrna) (Rev. 2:8-11). Visit the agora with special access to see some very significant graffiti dating from early second century. Drive on to the resort town of Kusadasi for the next three nights. Today you can sleep in, relax by the pool, shop and explore Kusadasi. Drive to nearby Ephesus, once a thriving port town of 250,000 people. See the spectacular excavations of this ancient city including the agora where Paul worked with Priscilla and Aquila, and the theatre where the riot took place (Acts 19:29). Walk the streets that Paul walked as you view numerous other ruins, including the recently excavated terrace houses, which give you a sense of life in the ancient world. After lunch a wealth of artefacts awaits at the nearby Museum of Ephesus before heading to the ruins of the Church of St John where the Apostle was buried and from where the remains of the Temple of Artemis are visible. Leave the coast to visit the impressive ruins of Sardis (Rev 3.1-8). Here we’ll visit the gymnasium, synagogue and temple. After lunch make a brief stop at another of the Seven Churches, Philadelphia (Rev 3:7-13), commended for patient endurance under suffering. Drive through the Lycus Valley to Laodicea and see how, with hot springs of Hierapolis on one side and cold mountain springs on the other, Laodicea was ‘luke-warm’ (Rev 3:14-22). 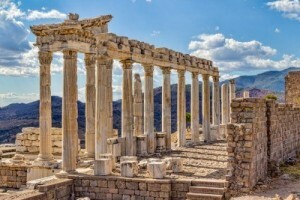 Laodicea is the most actively excavated site in Turkey at the moment and contains many acres of ruins to visit, including temples, an early church and remnants of a sophisticated water system. Overnight for two nights at a thermal spa hotel set in a rural village. Begin with a morning stroll through the extensive necropolis (cemetery) of Hierapolis. This huge city was a centre for pagan cults until it was transformed into a major Christian centre in the 4th and 5th centuries. Today it is a popular tourist destination with its stunning white calcified terraces and thermal springs. According to tradition, the Apostle Philip lived and was martyred in Hierapolis. Visit his martyrium and recently discovered tomb before walking a section of the pilgrim’s trail. Visit the newly discovered Plutonium where you can see the entrance to Hades (the underworld), and the impressive theatre. Plenty of free time will be provided to swim in the Pools of Cleopatra ($20), visit the terraces, or the museum. Finish the day at Colossae. The site has yet to be excavated, but walking over the mound provides an opportunity to observe ancient artefacts on the surface. Drive over the Taurus mountain range to Antalya (biblical Attalia). A walking tour includes a boat ride from the same harbour from which Paul and Silas sailed (Acts 14:25-26). Then enjoy some free time exploring the narrow streets, shops and bars of the beautiful old city. Visit two striking archaeological sites along the coast. Begin with Perge, a wealthy and culturally well-developed city in ancient times (Acts 14:25). After lunch continue to Side, an ancient Turkish harbour that has made a graceful transition into a lovely resort village. Its present popularity is due not only to its resort atmosphere, but also to the many archaeological ruins that permeate this ancient settlement. Return to Antalya for overnight. After a free morning transfer to the airport for a 1:25pm flight to Istanbul. Those taking the extension will then fly to Cappadocia. Students staying in Antalya to study the Book of Revelation will start classes. Leaving Antalya fly to Cappadocia (Acts 2:9; 1 Peter 1:1) via Istanbul. Begin to explore the incredible scenery of this ancient land before checking into the Hilton in Avanos (2 nights). Begin the day with an optional early morning hot air balloon ride over this stunning landscape (extra cost approx. AU$270). After breakfast explore the local sites including the Goreme Open Air Museum with its “fairy chimneys”, home to early (4th century) Christian communities which lived and worshipped deep in the rocks and crags, leaving their frescoes and paintings to be marvelled at centuries later. Next visit the Natural Citadel of Uchisar, the villages of Urgup and Cavusin, and drive through the Rose and Dervent Valleys. Optional (extra cost) of a ‘Whirling Dervish’ show before dinner. After breakfast visit the underground city of Kaymakli, where local people sought protection from marauding bandits over thousands of years. They form ‘cities’ that reach a depth of up to 7 stories below the surface. Head to the tranquil Ihlara valley and walk along the river deep in the gorge and enjoy lunch by the river. Drive to the airport for our flight to Istanbul (ancient Byzantium) for 3 nights. Begin with a visit to the Chora Church with its stunning mosaics from Byzantine times. Start a street-food inspired tour with a visit the famous Spice Market to enjoy the smells and flavours of the East. Try some ‘ekmek balik’ before taking a relaxing cruise up the Bosphorous. Eat a special lunch in the trendy Ortakoy district before taking the coach to Taksim Square and the vibrant Istiklal Street where more exotic food awaits. Taste some amazing baklava, walk the Galata Bridge and take the back streets to the hotel. Today visit the Hagia Sophia, largest and most significant church in Christendom for over 1,000 years and then on to the famous Blue Mosque, Hippodrome and underground cistern. A free afternoon provides opportunity to explore the Grand Bazaar, Topkapi Palace or the Istanbul Archaeological Museum. A transfer to the airport (10am) will connect with most flights back to Australia or on to other destinations.